Flat bottom boats on the Oi River. 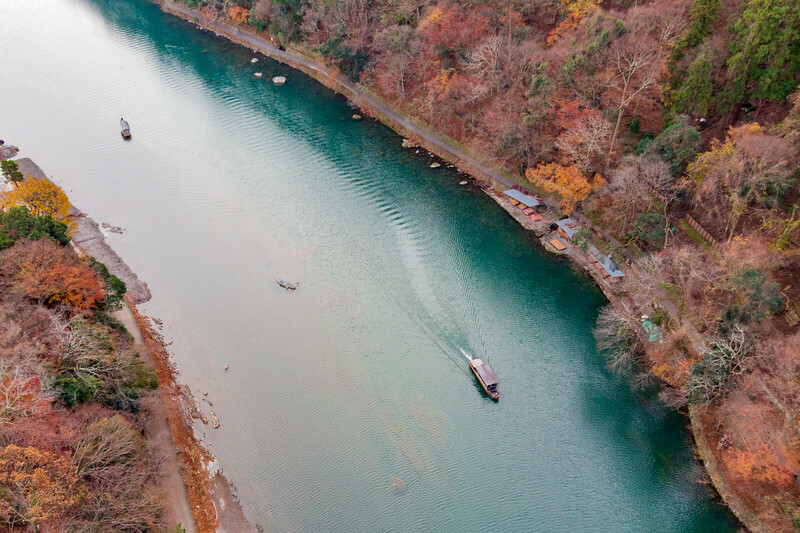 You can see how shallow the river is in this aerial view. 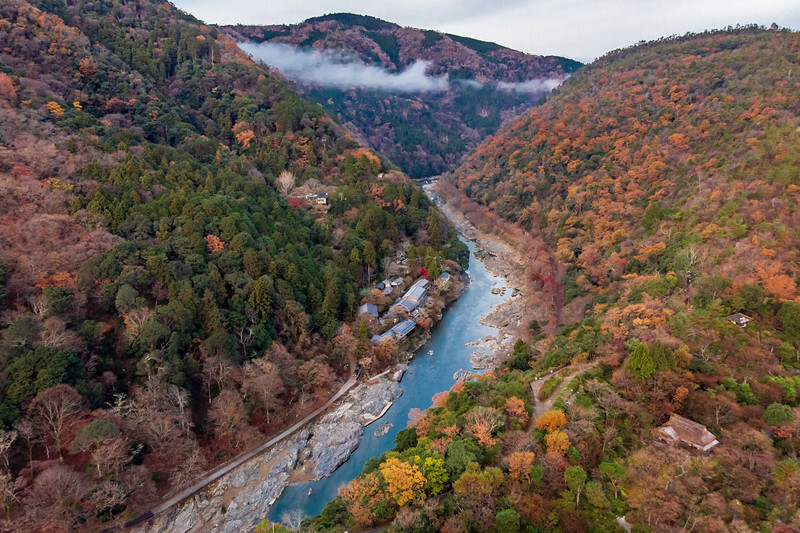 This drone shot looks down at the Hozo River in western Kyoto. 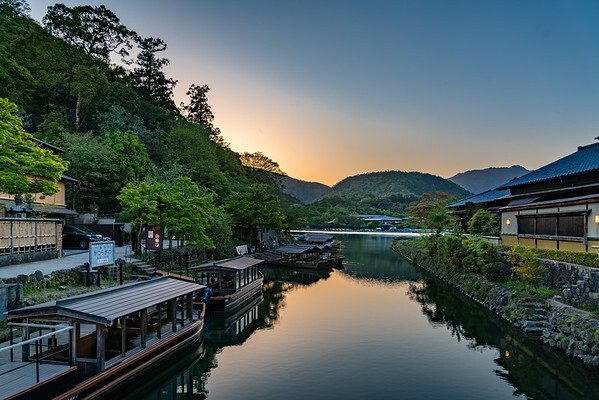 In the center is the Hoshinoya Resort Hotel and the small building above it is Daihikaku Temple. 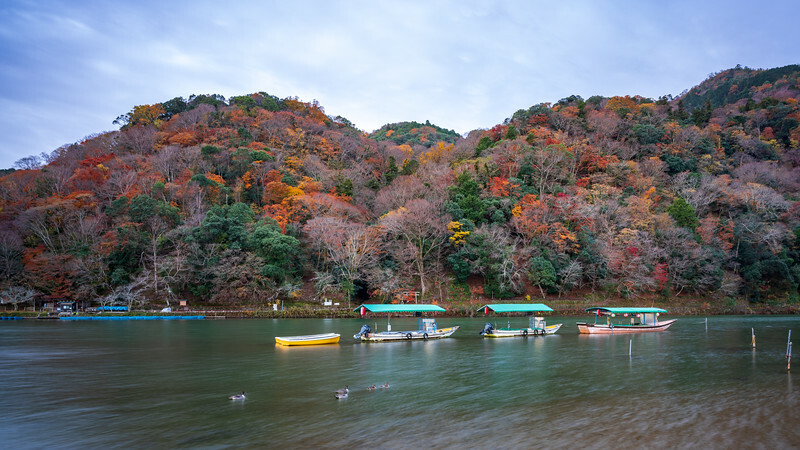 The river is usually shallow, and they have run flat bottom pleasure boats down the river for centuries. 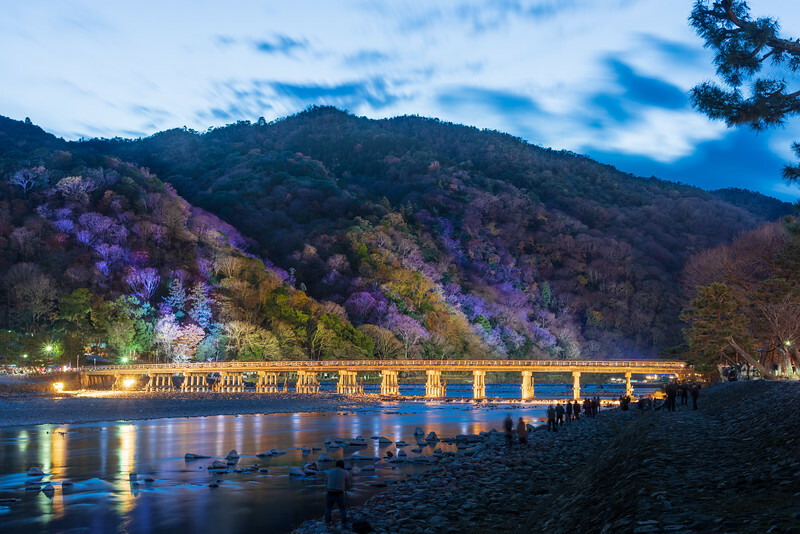 Big banks of lights illuminate the Togetsu Bridge and the hills of Mt. 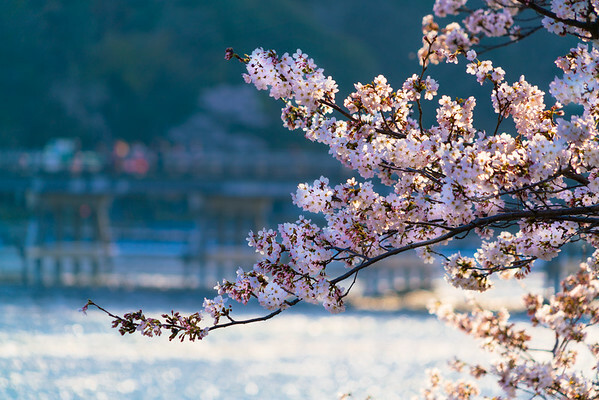 Arashi, during the Arashiyama Hanatouro celebration (花灯路). 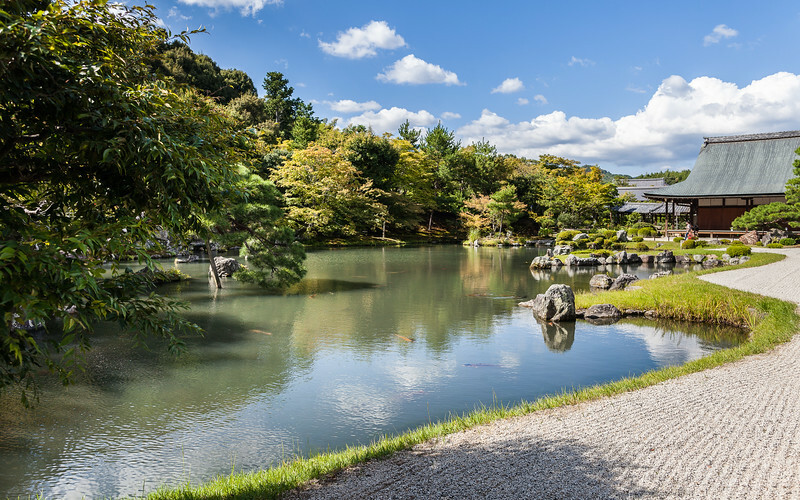 Shugaku-in Imperial Villa, another property maintained by the Imperial Household in Kyoto. 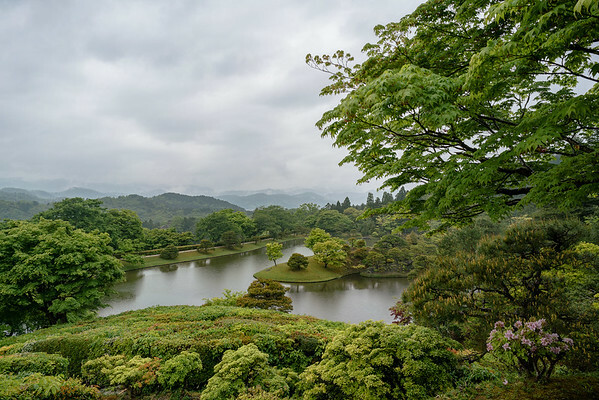 Essentially a series of gardens, it was established in the 17th century. At Rurikoin, a historic villa in northern Kyoto. 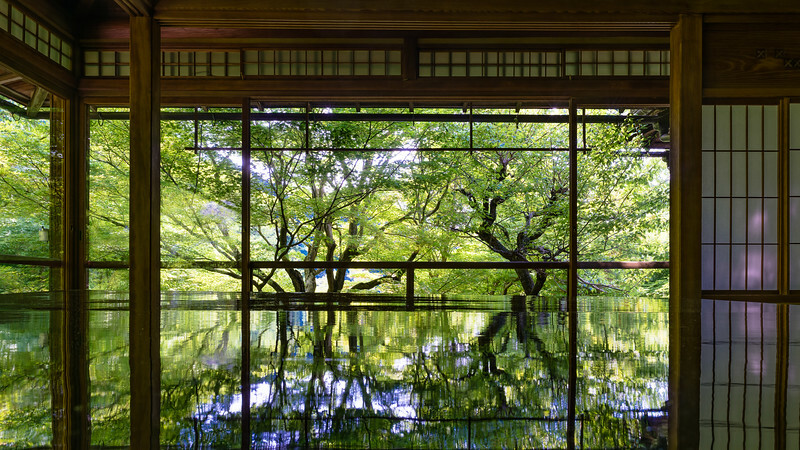 Beautiful greenery out the windows of this traditional Japanese home. Even more astonishing is the reflection off a large, highly polished table on the tatami floor. 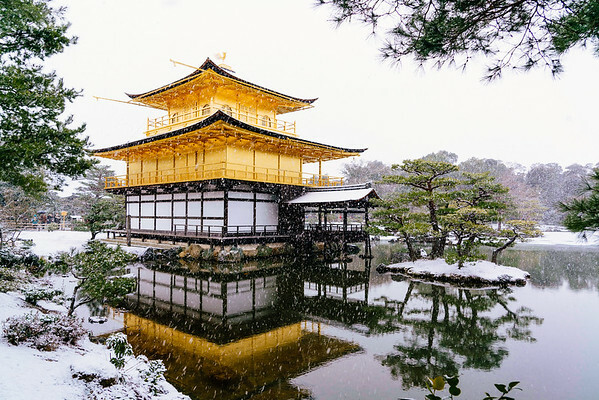 An architectural photo of the main hall (Kon-do) at Ninna-ji Temple in Kyoto, built in the 17th Century (early Edo Period) and a Japan National Treasure. 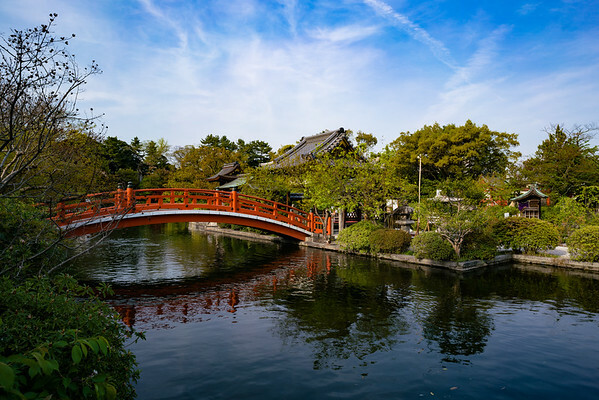 Wandering around in the Nijo Castle area, roughly in the center of Kyoto, we stumbled upon this beautiful little shrine with water, a bridge and a boat. 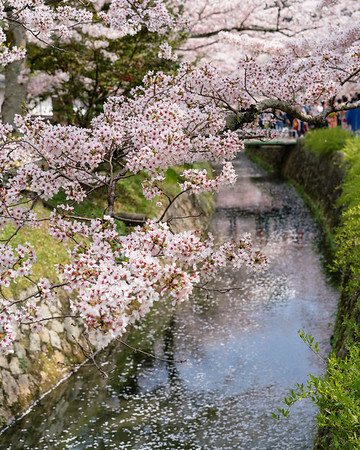 According to the signage, this was a favorite spot of Emperor Kanmu who originally set up Kyoto in the 9th century. 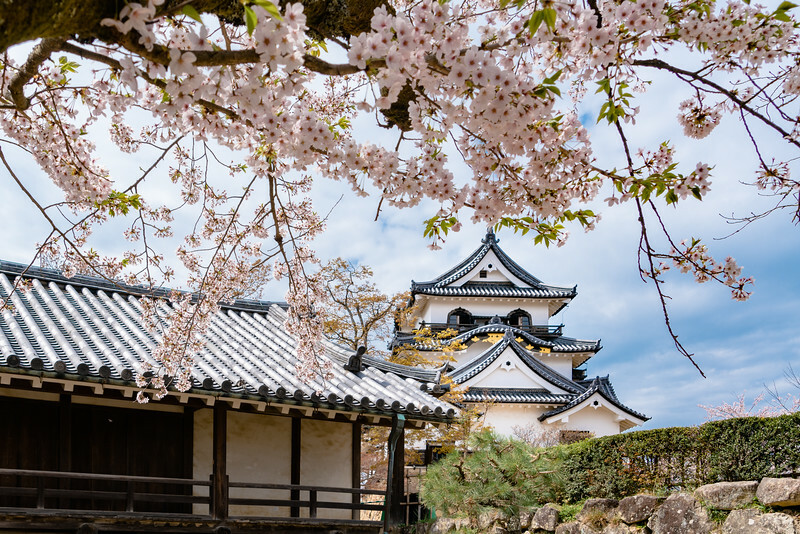 This kind of ancient history pops up everywhere in Kyoto, that's one of it's most seductive features. 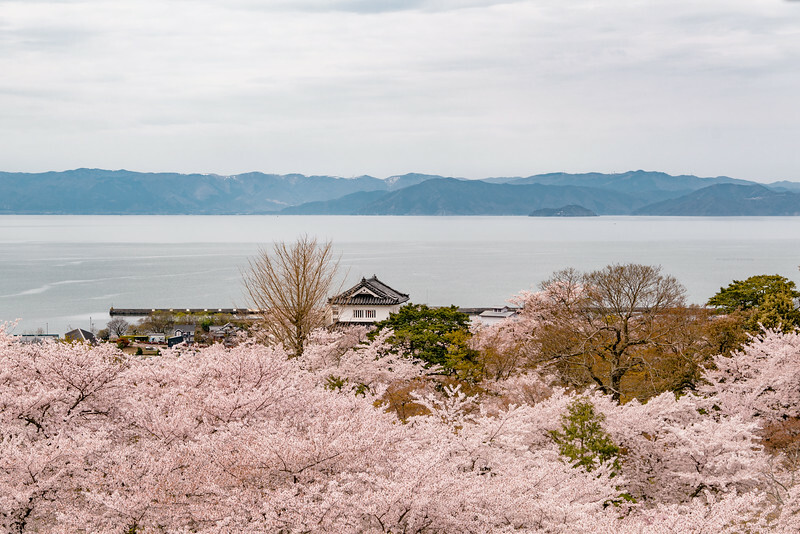 Looking out over Lake Biwa from the top of Hikone Castle. 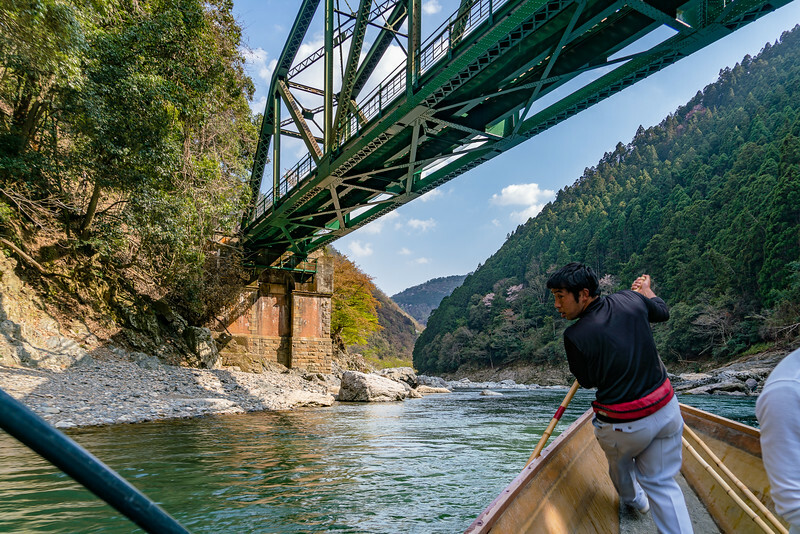 Boatman maneuvers a flat bottom boat past rocks (and under a bridge) in the shallow Hozu River, west of Arashiyama in Kyoto. 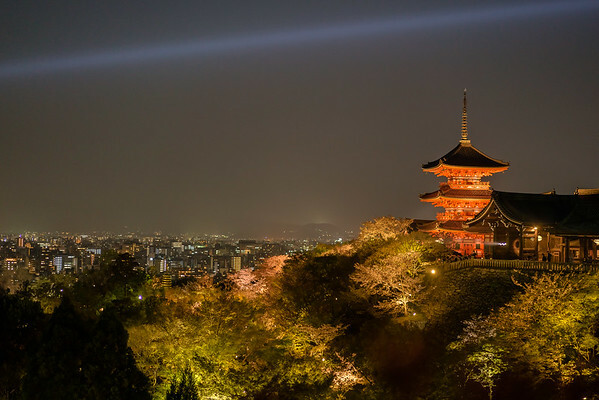 A special presentation at Kyoto's famous Kiyomizu Dera temple, with the trees and buildings lit up and a light beam shining across the Kyoto skyline. 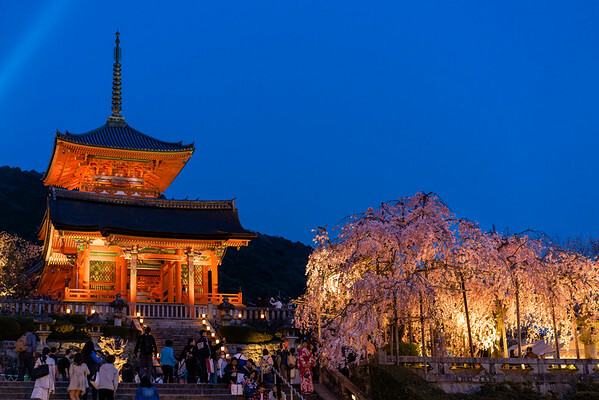 A special presentation at Kyoto's famous Kiyomizu Dera temple, with the cherry trees and buildings lit up. 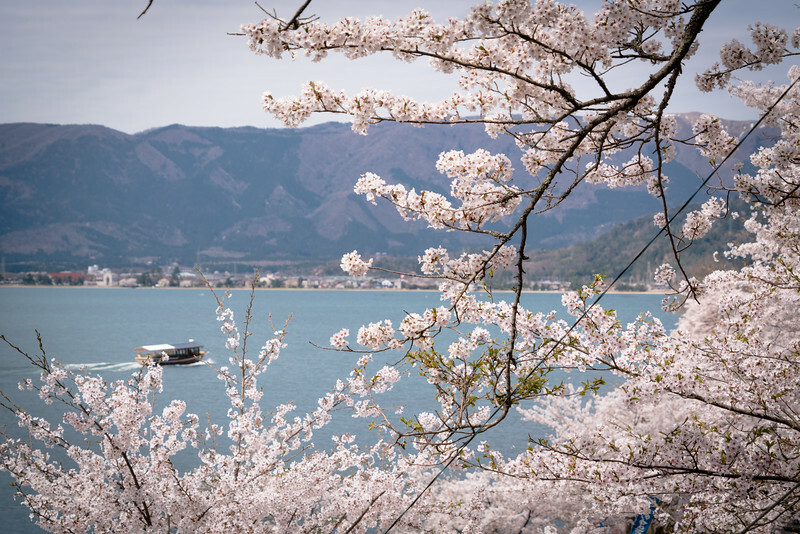 Cherry blossoms in Arashiyama with the Togetsu Bridge behind. 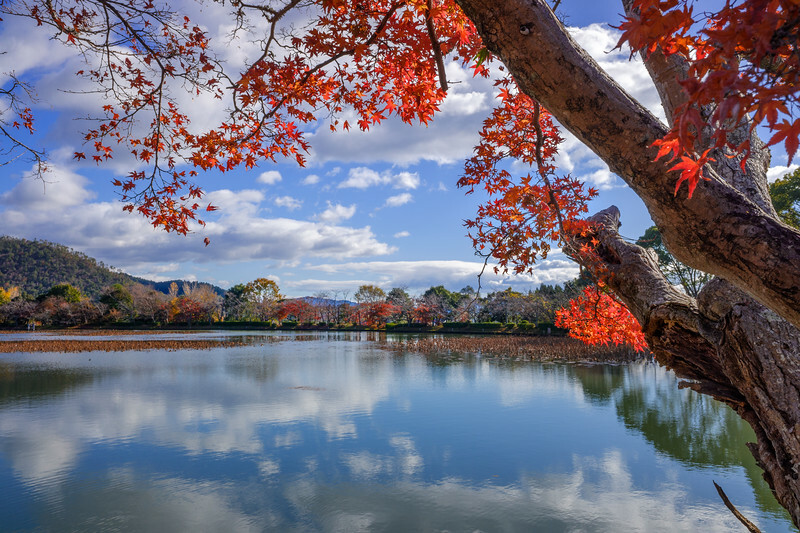 Kyoto Imperial Palace, used by Japan's Emperors until the Meiji Restoration in 1869 when Japan's capitol moved to Tokyo (Edo). 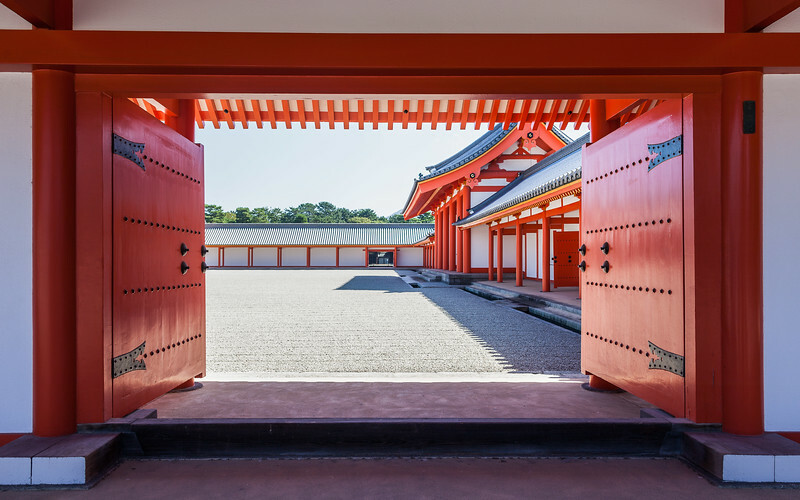 This orange door looks into the interior garden.